Members of Congress subjected the CEOs of a pair of rogue corporations to much-deserved castigation in recent days, but the executives will probably turn out to be the victors. John Stumpf of Wells Fargo and Heather Bresch of Mylan endured the barbs knowing that they will not lead to any serious consequences. The periodic grilling of business moguls amid corporate scandals is a longstanding feature of Congressional oversight. In the 1930s the Senate Banking Committee, led by investigator Ferdinand Pecora, questioned Wall Street titans such as J.P. Morgan about the causes of the stock market crash. In the late 1950s Sen. Estes Kefauver asked pharmaceutical executives about rising drug prices. In the 1960s Sen. Abraham Ribicoff, with the help of a young lawyer named Ralph Nader, interrogated auto industry executives about their seemingly cavalier attitude toward safety. Jumping to the recent past: In 2010 the CEO of BP was hauled before a House hearing to testify about the Deepwater Horizon disaster. In 2013 the Senate’s Permanent Subcommittee on Investigations questioned Apple CEO Tim Cook about his company’s international tax avoidance. And so forth. Yet there is a big difference between the older and the more recent hearings. In the 20th Century these events were preludes to legislative reform. The Pecora hearings led to the passage of the Glass-Steagall Act separating speculative activities from commercial banking. Kefauver tried but failed to pass price restrictions but was able to enact stricter drug manufacturing and reporting rules. The Ribicoff hearings led to the passage of the National Traffic and Motor Vehicle Safety Act and the Highway Safety Act. Those earlier hearings may have been political theatre, but they were followed by serious regulatory changes. Today’s hearings, on the other hand, seem to be nothing more than theatre. For many members of Congress, they are opportunities to pretend to be concerned about corporate misconduct while having no intention to do anything about it. The Consumer Financial Protection Bureau, the lead regulator in the Wells Fargo fake accounts case, is a favorite target of conservative lawmakers. Right after the CFPB’s Wells Fargo announcement, Speaker Paul Ryan sent out a tweet claiming that the agency “tries to micromanage your everyday life.” Senate Banking Committee Chair Richard Shelby tried to block the appointment of Richard Cordray to head the CFPB and subsequently sought to weaken the agency. And during his opening statement at the hearing, he took a pot shot at CFPB for not being aggressive enough in pursuing the case. Congressional grandstanding against corporate miscreants has been going on for decades, but what was once a device to build public support for real legislative change now serves mainly to conceal the fact that too many legislators are in office to do the bidding of corporations, even the most corrupt ones. 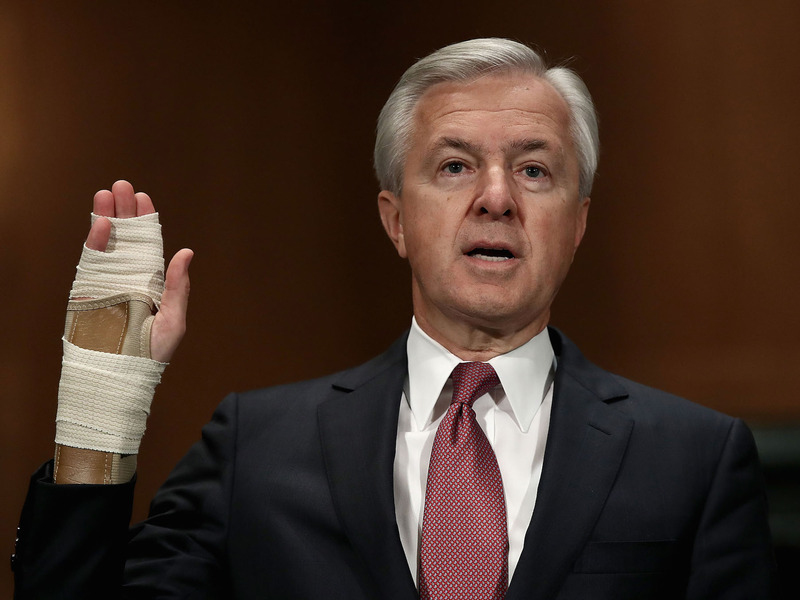 The chief executive of Wells Fargo would have us believe that more than 5,000 of his employees spontaneously became corrupt and decided to create bogus accounts for customers who were then charged fees for services they had not requested. John Stumpf has earned himself a place in the corporate hall of shame for putting the blame on underlings for carrying out a fraud that must have been sanctioned by top officials at the bank, which has a reputation for pushing new products on customers. He may have been inspired by Volkswagen, whose senior people have been claiming that they knew nothing about systematic cheating on auto emissions tests. After the announcement that Wells would pay $185 million to settle the case, Stumpf did a self-protective interview with the Wall Street Journal in which he insisted that the misconduct was in no way encouraged by management and was inconsistent with the bank’s internal culture. Few seem to be buying that argument, and Wells is facing various federal investigations. The notion that Wells had been a paragon of virtue is preposterous. The dishonesty begins with its name, which evokes the legendary stagecoach line. The company is actually the descendant of Norwest, a bank holding company based in Minneapolis which changed its name after acquiring the old Wells Fargo in 1998. Four years later, the combined company had to pay a penalty of $150,000 to settle SEC charges of improperly switching customers among mutual funds. In 2005 the securities industry regulator NASD (now FINRA) fined Wells $3 million for improper sales of mutual funds. When Wells acquired Wachovia Bank amid the financial meltdown of 2008 it acquired a bunch of legal problems, including a municipal securities bid rigging case that required a $148 million settlement. Recent years have seen a long list of additional scandals and settlements. In 2009 Wells had to agree to buy back $1.4 billion in auction-rate securities to settle allegations by the California attorney general of misleading investors. In 2011 it agreed to pay $125 million to settle a lawsuit in which a group of pension funds accused it of misrepresenting the quality of pools of mortgage-related securities. That same year, the Federal Reserve announced an $85 million civil penalty against Wells Fargo for steering customers with good qualifications into costly subprime mortgage loans during the housing boom. In 2012 Wells Fargo was one of five large mortgage servicers that consented to a $25 billion settlement with the federal government and state attorneys general to resolve allegations of loan servicing and foreclosure abuses. Later that year, the Justice Department announced that Wells Fargo would pay $175 million to settle charges that it engaged in a pattern of discrimination against African-American and Hispanic borrowers in its mortgage lending during the period from 2004 to 2009. Also in 2012, Wells agreed to pay $6.5 million to settle SEC charges that it failed to fully research the risks associated with mortgage-backed securities before selling them to customers such as municipalities and non-profit organizations. In 2013 Wells was one of ten major lenders that agreed to pay a total of $8.5 billion to resolve claims of foreclosure abuses; it settled a lawsuit alleging that it neglected the maintenance and marketing of foreclosed homes in black and Latino areas by agreeing to spend at least $42 million to promote home ownership and neighborhood stabilization; and it agreed to pay $869 million to Freddie Mac to repurchase home loans the bank had sold to the mortgage agency that did not conform to the latter’s guidelines. Jumping to 2016: the Justice Department announced that Wells would pay $1.2 billion to resolve allegations that the bank certified to the Department of Housing and Urban Development that certain residential home mortgage loans were eligible for Federal Housing Administration insurance when they were not, resulting in the government having to pay FHA insurance claims when some of those loans defaulted. And a few weeks before the CFPB revealed its sham accounts penalty against Wells, the agency fined the bank $3.6 million plus $410,000 in restitution to customers to resolve allegations that it engaged in illegal student loan servicing practices. Contrary to Stumpf, the sham accounts were much in line with the culture of Wells, which has been corrupt for years. As long as the bank’s top management denies the reality, it seems unlikely anything will change. Note: This post draws from my newly updated Corporate Rap Sheet on Wells Fargo.